We love chili around these parts for many reasons – the number one reason being that it’s tasty! Other reasons include: cost, versatility, it’s easy to make, it’s a great meal to make for a crowd. We have semi-regular game nights at our house with a group of people who love to play games – Settlers of Catan, Starfarers of Catan and Power Grid are some of our favourites. We always start the evening with a meal. I usually make the main dish & everyone else brings sides, drinks & desserts. It’s a fun bunch of people. There are heaps of kids running around playing too. Good times. 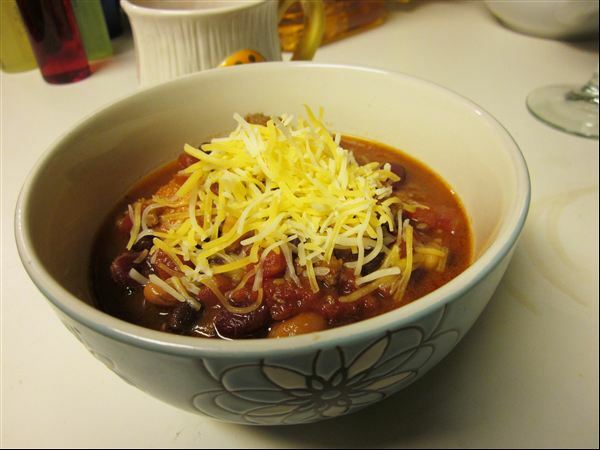 One of the main dishes that I make regularly is chili. It’s cost-effective for feeding a lot of people and easy to get ready early in the day. I don’t actually have a recipe that I follow so it always turns out a bit different, but I thought I’d share the general guidelines that I use. I start with either ground beef or ground turkey – browned up with some onions. I adjust the amount depending on how many people are coming. In my last batch I used both ground beef and some andouille sausage that I had on hand and I actually think it was the best I’ve made so far. So I add the browned meat and onions to the crock pot along with a couple of large cans of diced, pealed tomatoes and several cans of rinsed and drained beans. 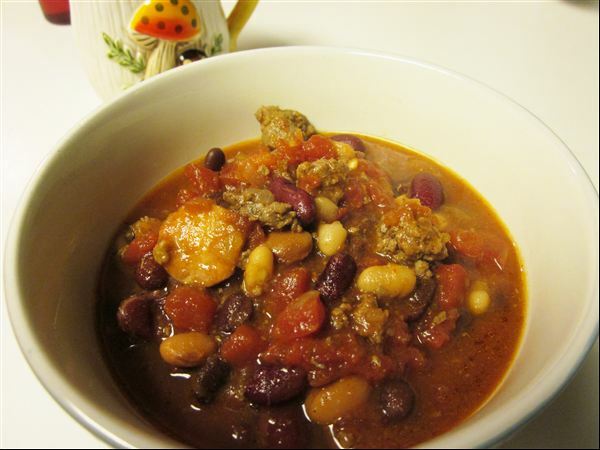 I use several types of beans in each batch – black, pinto and kidney are what I use mostly, but I’ll try anything! I stir it all together and season it with Johnny’s Season Salt and McCormick Taco Seasoning. I also add a generous amount of cummin. Sometimes I also put corn in the mix. That’s pretty much it. I set the crock pot on low and check in on it throughout the day, adjusting the seasoning as necessary. I don’t add much heat because it’s usually a mixed crowd with lots of kids – if you’re with a group of people who can handle it, it can definitely be spiced up. I think that’s why I liked my last batch with the andouille sausage so much – it gave some heat without overpowering the mix. We serve it with grated cheese, sour cream and raw onions for those who like that sort of thing! We usually have cornbread and/or tortilla chips and/or Fritos as well. It’s a super versatile recipe with lots of room to put your own spin on it. What are your favourite chili ideas? Categories: Tasty Tuesday | Permalink.